Edward Hale Brooks was born on 25 April 1893 in Concord, New Hampshire. His father, Edward Waite Brooks, was a salesman. His mother was the former Mary Frances Hale. Ted Brooks had three sisters, Harriet, Gretchen and Alice Brooks. Both Gretchen and Alice died in their infancy. He was graduated from Concord (NH) High School, after which he attended Norwich University (The Military College of New England) in Northfield, Vermont, graduating in 1916 with a Bachelor of Science Degree in Civil Engineering. He later also received a master's degree from Norwich University and an honorary doctoral degree in military science from Pennsylvania Military College. He began his military career in June 1915 as a Captain with the 1st Cavalry of the Vermont National Guard. During World War I, he served with the 3rd Division in five major engagements. He was first a Battery Commander in the 76th Field Artillery and later assistant G-3 of the 3rd Field Artillery Brigade. During the Meuse-Argonne campaign, he earned a Distinguished Service Cross when he "... exposed himself to heavy and accurate artillery fire directed on an ammunition train while driving a loaded ammunition truck to safety, the driver of which had been killed by enemy fire." Ted was in the Army of Occupation in Europe until August 1919. He was also a member of the 3rd Division football team. In 1921, at the American Legion Convention in Kansas City, he captained the Army team that defeated Great Lakes Naval Training Station 20-6. He served as a Gunnery instructor at Fort Sill, Oklahoma, from 1922 to 1926, then was in the Philippines for two years where he had command of Battery D of the 24th Field Artillery, a pack mule outfit. Ted was then transferred to Ft. Riley, KS, served there 1928 to 1932. There his artillery battery, a horse drawn outfit, was the first to complete a 100 mile forced march in less than 24 hours. It was an accomplishment produced by vigorous training of both men and animals. From 1932 to 1934 he attended Command and General Staff school at Fort Leavenworth, Kansas, then to Harvard University as ROTC instructor from 1934 to 1936. He attended War College 1936-1937 and was detailed as an instructor in the attack section of the Command and General Staff School. Ted Brooks was chief of the statistics branch of the old War Department General Staff from 1939 to 1941 where he was closely associated with General George C. Marshall and Secretary Stimpson. By this time he had risen to the rank of Lieutenant Colonel. In September 1941, General Jacob L. Devers requested that Brooks be named to the staff of the new armored force being formed at Fort Knox, Kentucky. With this came promotion to Brigadier General. Consequently, he never wore eagles! In 1942 he was promoted once again to Major General. In this capacity he played a major in development of the M-7 self-propelled artillery piece and the M-8, assault gun, both potent forces in armored tactics. 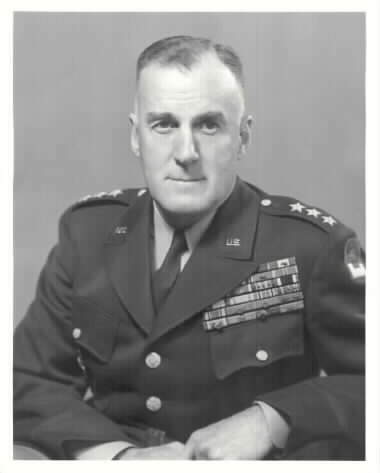 From 1942 he was commander of the 11th Armored Division until March 1944, when he was sent to England to take command of the 2nd Armored Division ("Hell on Wheels") and led that elite unit into Normandy. The division was prominent in the break-through at St. Lo, crossed the Rhine, and was said to be the first Allied division to enter Belgium. General Brooks contributed, in particular, his skills in artillery coordination to the division. General Brooks was awarded a Silver Star for repeatedly attacking enemy positions along his line and for the rapid commitment of his division against the enemy. He was cited for "personal gallantry and leadership." Later in the war he rose to the command of the VI Corps and its nearly 150,000 men. Accepting the surrender of the German 19th Army during this time (two days before V-E day) was what he considered to be one of his greatest achievements. It was shortly thereafter when one of his deepest personal tragedies occurred, the death of his son, Major Edward Hale Brooks, Jr. (USMA January 1943), in an airplane crash in Germany after the war had ended. This left him with his wife, Bea, his daughter, Betty, and her husband, R. Potter Campbell, Jr. (USMA 1941). In 1949 General Brooks was promoted to Lieutenant General when he was named assistant chief of staff for personnel (G-1). He then served as commanding general of the 2nd Army at Fort Meade, Maryland from 1951 until he retired from active service in 1953. He lived another blissful 25 years in Concord, New Hampshire, dedicated to his family and hobbies of fishing and gardening. The following paragraph is an excerpt from his eulogy as written and presented by General Charles D. Palmer. "He was an exceptional and courageous leader who inspired confidence, demanded much of his subordinates but gave more of himself, was very strict but fair, never sought personal power and glory. He pushed forward deserving subordinates, but never pushed forward himself, was very modest and very human. Subordinates sometimes referred to him as a "lucky general" not meaning that he himself was lucky but that he was lucky for them - such was their confidence that he and they would succeed." General Brooks was known as "standing Eddie" for his unusual habit of standing up in his jeep as he reviewed the troops so he could better see them. He even had a special railing welded into the jeep to hold onto for this purpose. An example of his legendary fairness is the story of his hiking 20 miles himself in full pack in order to set a reasonable time in which to expect his troops to complete it. He was much beloved and respected by his family. He taught his grandchildren and great-grandchildren to fish and camp, he cared about and was beloved by all the children of our family. A finer man and role-model we couldn't have asked for. Apparently his comrades felt likewise, for his walls were lined with signed pictures from the likes of Eisenhower, Churchill, Montgomery, Bradley and others voicing their respect for the "great warrior". He was the man we called "the General", "the old Indian fighter", and "standing Eddie". His grandchildren and great-grandchildren just called him Daddy-Pop, and we were all the better for having known him. General Brooks and his family lie at rest in Section 30 (grave 1068) of Arlington National Cemetery. In all, Gen. Brooks was awarded Distinguished Service Cross, Distinguished Service Medal with Oak Leaf Cluster (oak leaf cluster), Silver Star with oak leaf cluster, Legion of Merit with oak leaf cluster, Bronze Star Medal, Commendation Ribbon with Metal Pendant, World War I Victory Medal with 5 Battle Clasps, Army of Occupation of Germany Medal (World War I), American Defense Service Medal, American Campaign Medal, European-African-Middle Eastern Campaign Medal with 1 Silver Service Star, World War II Victory Medal, and National Defense Service Medal. French: Legion of Honor, rank of officer. Croix de Guerre with Palm. 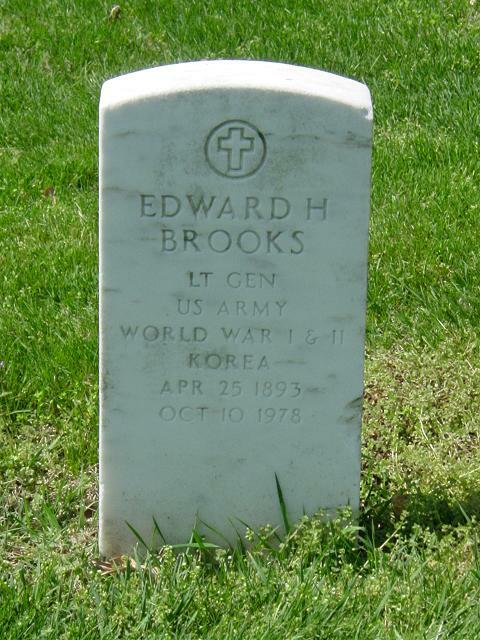 In 1946, General Brooks' son, Major Edward Hale Brooks, Jr. (USMA Jan 1943), died in an airplane crash in Germany while piloting a bomber back to the United States. Fort George G. Meade, Maryland.